In 1978, planetary scientist and volcanologist Rosaly Lopes was finishing her last year of undergraduate school at the University of London with intentions to become an astronomer. But on a whim, she took a planetary science class for one of her final undergraduate courses. It was just three weeks into class when the volcano Mount Etna erupted off the coast of Sicily, sending her professor to survey the effects and igniting a new curiosity in Lopes. Rerouting her future plan from studying the stars, she decided to study volcanoes on Earth and in space instead. "It had a sense of adventure for me," she remembers. Just one year later Lopes visited that same volcano on fieldwork while in graduate school. If she was unsure of her new career choice, her decision was solidified when Mt. Etna erupted once more. And Lopes "was only a mile away." Lopes, 55, is petite with blonde hair. She's a Senior Research Scientist and Deputy Manager for Planetary Sciences at NASA's Jet Propulsion Laboratory (JPL) and speaks animatedly about her career and her passion for science, an interest rooted in her childhood. Growing up during the beginnings of the Apollo program in Rio de Janeiro, Lopes declared at the age of seven that she'd become an astronaut. But after realizing that her candidacy would prove difficult because she was a "Brazilian woman with poor eyesight," she switched gearsat age 10 and decided "the thing I ought to do was work for NASA." Despite her parents' concerns, she relentlessly pursued her goal. "I'm very stubborn, so I persisted," recalls Lopes. Lopes finally got the opportunity to work for NASA in 1989. After living in England for 13 years where she held a civil service job working for the Old Royal Observatory, she was offered a temporary job in the United States to work for JPL. Though her friends warned her of leaving a job of such permanence for one of instability, she jumped for the chance. "I decided to take a risk," says Lopes. Just two years later she became a member of the Galileo Project, a spacecraft which flew by Venus and Earth on its way to study Jupiter. Since then, her work at JPL has focused on the geology of bodies in space, with an emphasis on the volcanic features of Saturn's moon Titan and Jupiter's moon Io. "We're trying to find out the physics behind volcanic eruptions," she explains. Lopes explains that studying volcanoes in space provides greater insight into the design of volcanoes on Earth, which is limited by a narrow range of magma composition and an unchanging gravity and atmospheric pressure. Planetary research therefore provides broader knowledge of the workings of an earthly volcano. Without the restriction of plate tectonics and with the addition of varying gravities and atmospheres, the planets become "natural laboratories" for studying volcanoes — even more so because volcanoes on other planets are often much larger than those on Earth. For the past eight years Lopes has been working on the Cassini Mission, an in-depth, upclose study of Saturn's moons Titan and Enceladus during the planet's entire seasonal period. As the Investigation Scientist for the spacecraft's radar, Lopes acts as a liaison between the science team and project engineers and managers. "No two days are ever the same," says Lopes about her growing list of responsibilities. And no two volcanoes are the same either. She's visited over 50 volcanoes throughout her career. Her extensive knowledge and experience with volcanoes compelled her to write The Volcano Adventure Guide, the only book in existence that describes every volcano on the planet. "You've got to know what you're doing around active volcanoes," advises Lopes. "I've come across people who are totally unprepared." While writing seems to be her favorite pastime—she's currently working on her seventh book—she maintains a commitment to representing the Division for Planetary Sciences (DPS) , part of the American Astronomical Society within the broader science community. As Vice-Chair of DPS, she helps organize its annual meeting and reaches out to the community for support. Additionally, Lopes is a member of the International Astronomical Union, which is responsible for planetary systems' nomenclature at "naming conventions...to determine the name of a new moon, [the name of the] gap between rings" or any new finding in the solar system. And on occasion she will lend her help at school science fairs, judging students' model volcanoes. As Lopes grows in her understanding of the enigmatic workings of volcanoes, tremendous "beasts" that have significantly shaped the planet, she continues to believe that curiosity and a passion for constant exploration is the key to any discovery. "You have to be sufficiently humble to know that you never know enough," she says. Correction: An earlier version of this article stated that Lopes has "visited a total of 71 volcanoes throughout her career, earning a Guinness World Record for seeing more volcanoes in the world than any other human being." This was incorrect. 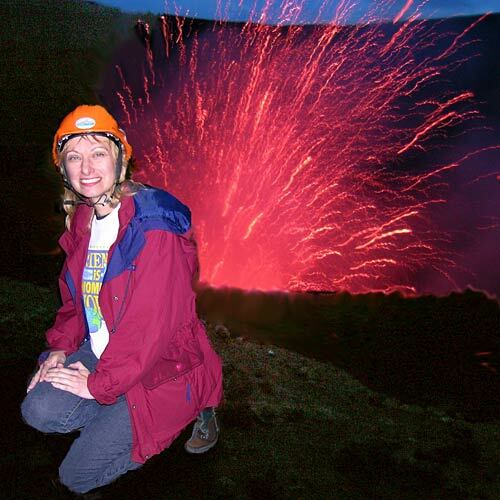 Lopes has visited over 50 volcaneos during her career, not a Guinness World Record.